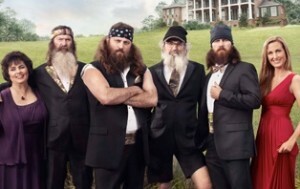 A&E has indefinitely suspended Duck Dynasty star Phil Robertson from the network for speaking against homosexuality in a recent interview with a popular men’s magazine. The January 2014 issue of GQ features an interview with the famed duck call inventor and reality show star, covering a variety of topics from his personal testimony to health care, to his views on hunting and Creation. However, Robertson’s comments about homosexuality have generated the most controversy—and have now ended up putting him out of a job. “What, in your mind, is sinful?” Magary, who laces the article with profanity, asks. He then quotes from 1 Corinthians 6:9. However, when homosexual activists learned of the popular duck hunter’s comments, they immediately released statements condemning Robertson’s remarks. A&E then released a statement from Robertson, explaining his comments in the publication. But hours later, A&E also released a statement, advising that it had indefinitely suspended Robertson from the broadcast. Robertson’s suspension has now generated both applause and outrage, with over 30,000 supporters joining a Stand With Phil Robertson Facebook page within hours of the announcement.